If you are planning to buy your first drum set for your child or for yourself, I’m guessing you don’t want to become a drum historian. You just want a good set at a fair price. Here are the basics of what you need to know to make an informed buying decision. 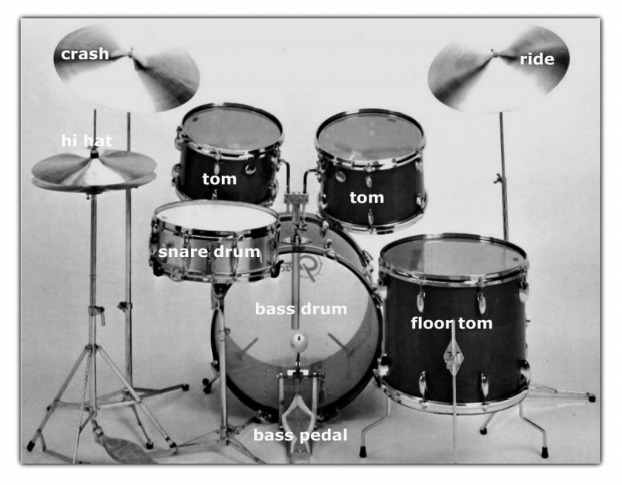 This is a picture of a basic 5 piece acoustic drum set labeled with the names of the drums and cymbals. The term 5 piece refers to the number of drums in the set. The cymbals are usually not included when you say how many pieces a drum set has. Some drum sets have double or triple the amount of drums and some have less, but this is the industry average. As far as the toms and floor toms go, you could get started with one, two, or even no toms, but the rest of the pieces are more important to the traditional drum set. The basics of what you need are a bass drum with a pedal, a snare drum with a stand, toms (toms can be mounted on a stand or they can be mounted on the bass drum like in this picture. Floor toms usually have legs that allow them to stand on the floor). The three cymbals you need are hi-hats, a crash, and a ride; each with a stand to mount them. The hi-hats are two cymbals both mounted onto the hi-hat stand which is attached to a pedal by which you can play the cymbals. You will also need a stool (usually called a throne) to sit on and some drumsticks to get started. The individual pieces of the drum set come in varying sizes both in length and diameter. The larger the drum, the lower its standard pitch. The average diameters for each of the drums are as follows. The bass drum: 22 inches, snare drum:14 inches, toms: 10, 12, and 14 inches, hi-hats: 14 inches, crash: 16-18 inches, ride: 20 inches. These sizes will vary from set to set. If you are buying a drum set for a small child, the sizes of each piece just need to be small enough so that he or she can reach everything comfortably. Most drum set manufacturers have child-sized drum sets available. The drum heads that go on the drum are tunable with a drum key and will wear out over time. One of the best ways to improve a drum’s sound is to put some new high-quality drum heads on it and tune it up. An alternative would be to purchase an electronic drum set, which consists of the same basic setup but what is struck is usually rubber pads or mesh heads that trigger the drum sounds electronically. The advantage to this would be that you can play using headphones and cut down the volume considerably. Electronic drum sets are usually a little more expensive than acoustic ones but are somewhat comparatively priced. Let’s talk money. How much will all of this will cost? It’s difficult to give exact figures. Most major drum set manufacturers offer beginner, intermediate, and professional models of drum sets. The main difference in cost between the three is mainly due to the material that the drum is made of (mostly different types of wood) and the quality of the hardware that comes with the set. To give you some rough ballpark figures, I would say you can get a beginner drum set starting at around $500, an intermediate one at about $800-$1200, and a top of the line drum set at around $2000-$5000. Some well known and trusted acoustic drum companies are Ludwig, Tama, Pearl, Yamaha, Sonor, DW, PDP, Gretsch, and Mapex. Some electronic companies are Roland, Alesis, and Yamaha. You can also get good deals on used sets from garage sales or pawn shops although if you buy a set from a retail store, you can usually take it back if there is anything wrong with it. If you are buying used, make sure there are no cracks in the cymbals. If there are clear see-through drum heads on the drums, check to make sure there are no nicks or dents in the bearing edges of the drums (where the wood touches the drum head). Check that all the tension rods (screws that tighten down the drum heads) are there. Also, make sure that the bass drum has the two support rods that stick out at the bottom to keep it stable. If you can, take the drums off of the stands and inspect both to see that everything loosens and tightens properly. Make sure that you have everything you need. Sometimes the stands and cymbals are sold separately from the drums. I hope this information helps you make an informed decision when buying your drum set.